"My installations draw upon imaginary and fragmented landscapes. When I introduce an object within an installation, it recalls the world from where it is derived from, like a fragment, it is a exploded variation. "The universe of Martin Boyce is multifarious, extracting fragments of reference as varied as architecture, design, cinema, Scottish literature, Japanese poetry, etc. His forms do not fit perfectly within one category and exist more as ghosts of meaning. For instance, a sculpture can distinctly resemble a tilted ping-pong table although all the elements deviate from such a table to a great extent. Concrete trees by Joel and Jan Martel made in 1925 for the Decorative Arts Exhibition in Paris are a recurrent theme throughout the work of Boyce, as well as replicas in Electric trees and telephone booth (2006) and formal traces in works such as We are still and reflective (2007). The artist sees these objects as a perfect "collapse" between architecture and nature. 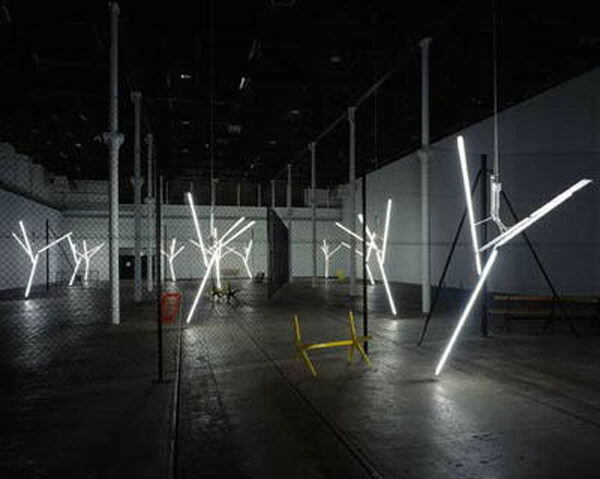 The sculptures, consisting of trees, gates, vents, signs, dot the exhibition space, becoming a stage. While the forms and materials from were conceived to be functional, Martin Boyce uses them less as objects of representation and more as objects of emotion. Their titles, extracted from fragments of poems, pop songs, slogans, exist as a way to "inhabit" the installations and poeticize the real.Martin Boyce was born in Glasgow, Scotland in 1967 where he lives and works today. The universe of Martin Boyce is multifarious, extracting fragments of reference as varied as architecture, design, cinema, Scottish literature, Japanese poetry, etc. His forms do not fit perfectly within one category and exist more as ghosts of meaning. For instance, a sculpture can distinctly resemble a tilted ping-pong table although all the elements deviate from such a table to a great extent. Concrete trees by Joel and Jan Martel made in 1925 for the Decorative Arts Exhibition in Paris are a recurrent theme throughout the work of Boyce, as well as replicas in Electric trees and telephone booth (2006) and formal traces in works such as We are still and reflective (2007). The artist sees these objects as a perfect “collapse” between architecture and nature. The sculptures, consisting of trees, gates, vents, signs, dot the exhibition space, becoming a stage. While the forms and materials from were conceived to be functional, Martin Boyce uses them less as objects of representation and more as objects of emotion. Their titles, extracted from fragments of poems, pop songs, slogans, exist as a way to “inhabit” the installations and poeticize the real. Martin Boyce was born in Glasgow, Scotland in 1967 where he lives and works today.